Do you remember Julia from Masterchef Australia 2012? The blonde girl who made these amazing melting moments? She pretty much received a standing ovation for them from the judges. I was watching that episode and I thought I NEED to make these! 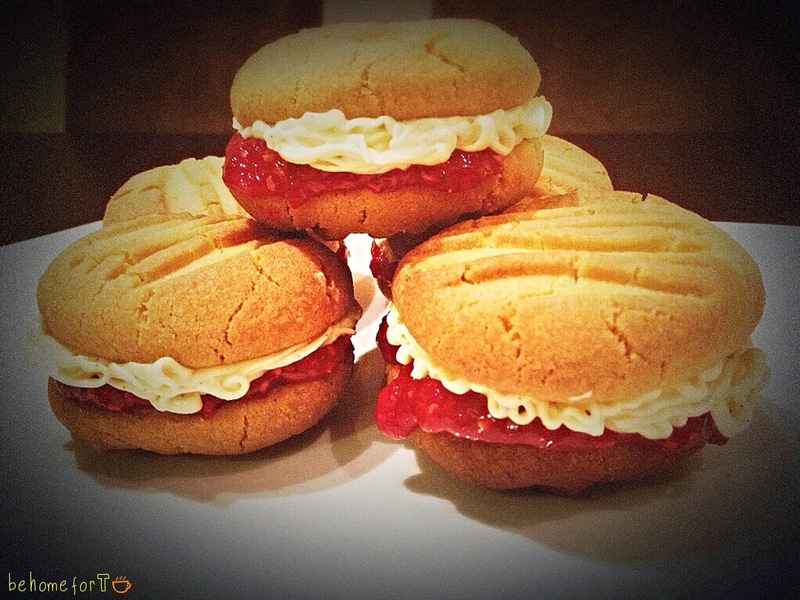 I'm not much of a cookie baker (I am a Cookie Monster though) and I had never tried melting moments before. Are these cookies Australian? No idea. It does not really matter though because they are delicious. As I had never tried a melting moment I had no idea how it was supposed to taste. However, as soon as I took a bite I was sold. Omigosh! So good! I ate about 5 of them. And when I took them to work the next day they were gone within minutes. The jam itself is so easy to make! When I realised how much sugar it contained I told myself to only use it as a treat. But I did not. I used it for everything. I put it on bread, on banana bread, on fruit, on scones, and I even ate it straight from the jar. So naughty! Do yourself (and your work colleagues if you decide to take these to work for morning tea) a favour and make these. Double the quantities in the recipe below because, trust me, one batch is not enough. The cookies are so filling but despite that, you won't be able to stop eating them. Preheat the oven to 180 degrees celcius and line two trays with baking paper. For the melting moments, cream butter for 2 minutes with electric mixer. Add icing sugar and custard powder and mix until combined. Sift the baking powder and flour together and then add to the dough and mix well. Make 40g balls, put them on the baking paper and press each ball with a fork to leave an indent. Bake the melting moments for 16-18 minutes (they should not be too dark) until they are lightly golden. Stand on trays for 5 minutes or so and then transfer to a wire rack to cool completely. Whisk the butter and vanilla until smooth. Add the icing sugar and beat until the mixture forms a paste which is smooth and does not have lumps. It should be the consistency of thick icing. Spoon into a piping bag fitted with a small star nozzle. Put the raspberries, sugar and lemon juice in a small saucepan and cook for 20-30 minutes until thickened. Mix the gelatine powder with one tablespoon of cold water. Remove jam from the heat and stir through the gelatine mixture. Transfer to a heatproof bowl or jar and cool in the fridge. 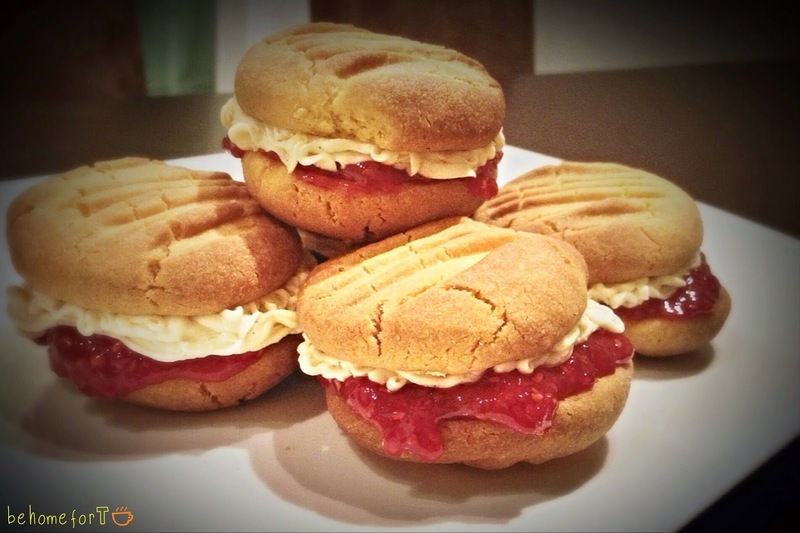 To put the melting moments together, place a spoonful of cooled jam on the base of half of the biscuits. Pipe the buttercream onto the base of the other half and gently press tho halves together. Dust with icing sugar before serving. If you decide to make cookies, make these. They are fantastic!